Looking for An Ocean City, MD Deal? You’ve Come to The Right Place! Looking for An Ocean City, MD Deal? You’ve Come to The Right Place! Ocean City is the perfect place for family fun. And you can make the most of your trip by taking advantage of these great Fun Family deals. Soon, you and yours will be playing on our beautiful beach, enjoying tons of great events and strolling our amazing boardwalk filled with exciting rides, tasty treats and unique shops. Take advantage of these Ocean City, Maryland hotel deals and packages. Book now! 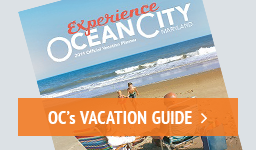 Get your FREE guide to the good times awaiting you in OCMD! Check out our blog for tons of ideas for your vacation! From the beach to your browser–a live feed of all the fun, all year long! Plan the ultimate golf vacation today! Cruis’in Week and Memorial Weekend rates starting at $150 per night.Ask for special rates for month of June! Free Coconuts Gift Card in May!